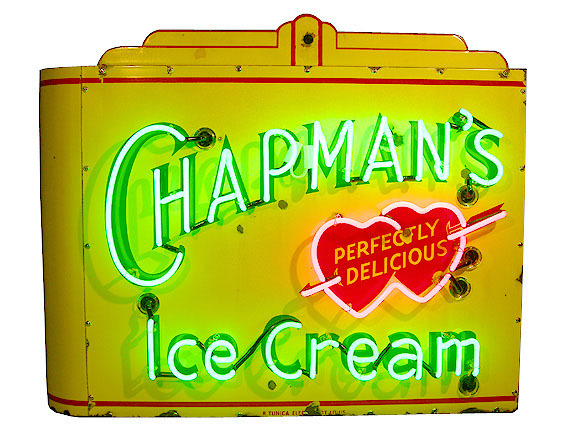 description: Chapman's Ice Cream, "Perfectly Delicious", a double faced porcelain enameled neon sign with bull nose front edge and art deco detailing. information: Chapman Ice Cream Company, 3912 Easton Boulevard, St. Louis, Missouri for years was one of St. Louis' favorite creameries. This sign was received as a project sign, nearly falling apart from the deterioration of the metal can, however the porcelain faces and bull nose section was in much better condition. Our Restoration Department rebuilt this sign; new can, transformer and new neon tubing. Click here to view the restoration of this sign.